Wish you all a very Happy Navratri! Stay Blessed! Navratri roughly translates to nine nights. Nine days of worshiping Goddess Durga. Nine days of remembering her virtues - the power of women to love, to sacrifice, to forgive, to defend one's self respect, to stand up for whats right, to fight against evil. Navratri is celebrated in different ways all across India. I have been introduced to these different ways of celebrations as i progressed through life. I was born into a Goan family whose kuldaivat/family goddess is Goddess Shri NavDurga. During Navratri, our temple in Goa takes on a festive yet spiritual mood. There is a big utsav organized and the goddess is taken around the periphery of the temple in a palki/palaquin. Apart from various pujas, there are also plays enacted on religious scriptures for entertainment. While growing up in Mumbai, i was introduced to Garba by a Gujarati family, the Patels. They organized navratri celebrations on our campus. Every night for those nine days, the idol/photo of Goddess Durga is kept in the center and all the people danced around it in concentric circles. The music that goes with it is very upbeat and rhythmic making it easy for everybody to dance to it. Garba is a sequence of steps where in you also clap to the beats. After garba, came dandiya where you dance in a similar manner but now use two small sticks to beat to the rhythm. Even though i was very young, i would borrow my mom's saree and fold it in half and drape it in gujarati style and dance through the night to these beats. I still try to make it to at least one Garba night here in Toronto. In the north of India, most people celebrate navratri with prayers and Kanya Puja. Young, pre-puberty girls are worshipped like Goddesses. The Anand family in our campus did a similar puja and i was one of the lucky ones to be invited there. Their son who was also our playmate had to wash our feet to his utter embarrasment and us teasing him endlessly. Then Aunty would put tikka on our foreheads and offer us prasad of puri(fried indian bread) - Kala chana(black chickpeas) and halwa(dessert made with semolina). This was the best tasting prasad i have ever had. Simple flavors but amazing combo. We were also given gifts or money. Post my marriage into a bengali family, i was introduced to Durga Puja. Bengalis celebrate only the last 4 days of navratri culminating into the 10th day of dusshera. A huge idol of Goddess durga is worshipped with chants and songs. People wear their finest new clothes and jewellery and partake in these celebrations. Every night bhog /prasad is offered as a full meal. The vibrations and aura around the idol can be felt deep within. There are lots of pujas organized here in Toronto and we try to visit some of them. Life has come a full circle with my daughter now being invited to Kanya Pujas. She loves the pampering and gifts but sadly cannot enjoy the food. Being gluten sensitive she can only eat the kala chana. 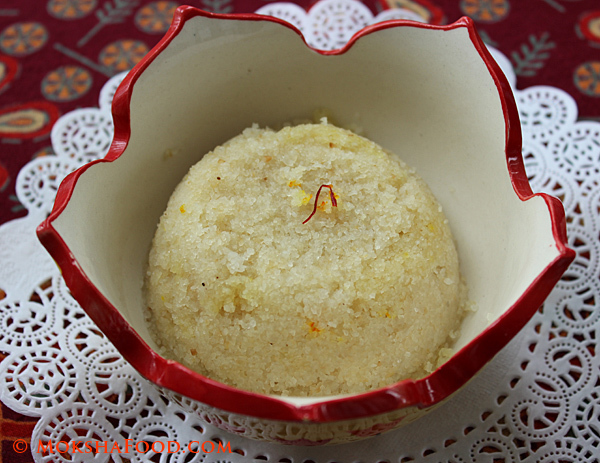 I decided to make the prasad gluten free just for her to enjoy. All 3 recipes are posted below. 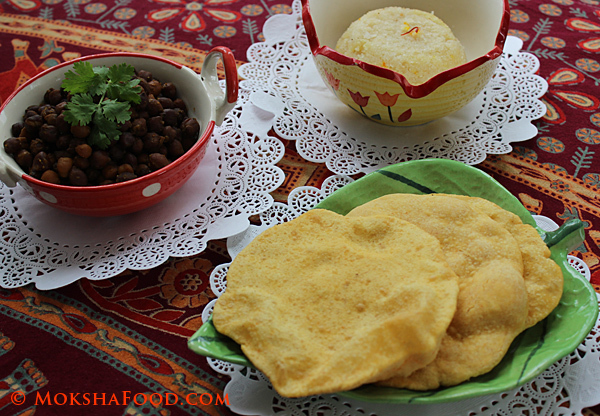 I usually make gluten free puri out of Amaranth flour/ rajgira. The recipe is posted here. 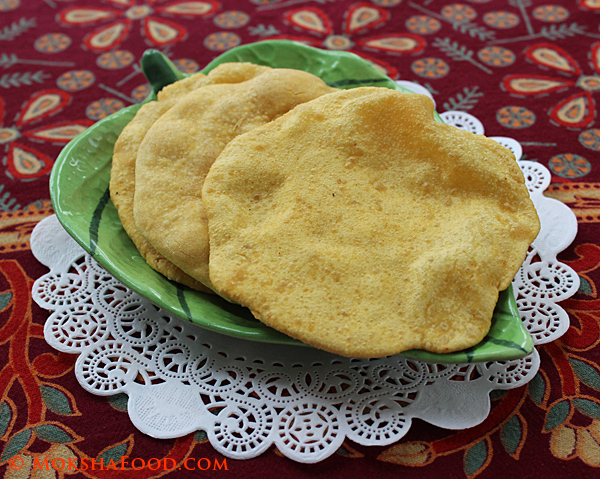 This time i tried another puri called besan puri made up entirely of chickpea flour. Wash the chickpeas well and soak in water overnight. Next day, drain off the water. Add fresh water enough to just cover the chickpeas and pressure cook them till done. In a saucepan, heat the mustard oil on medium heat till smoking hot. Mustard oil taste better this way. If using any other oil, just heat it to medium. Temper with cumin seeds till they sizzle. Add all the spice pdr and saute taking care not to burn the spices. Add the boiled chickpeas with some of their liquid. 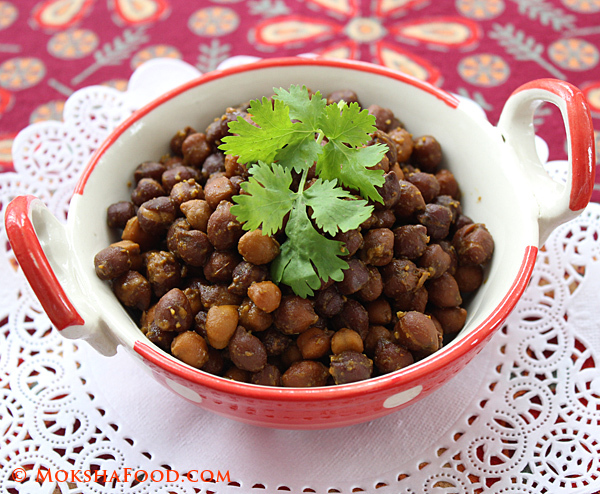 Let them cook further till all liquid has evaporated and the spices have coated the chickpeas well. In a saucepan, heat up 1 tbsp of ghee to medium. 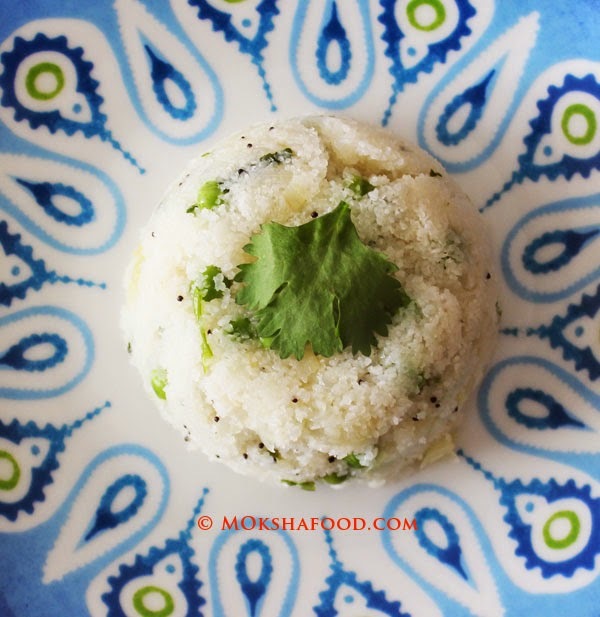 Add the idli rava and roast it gently till it changes color and a nice aroma emanates from it. In another small saucepan, heat up the water. Add the cloves, saffron and sugar to it. Bring it to a boil. Once the idli rava has nicely roasted, carefully add the boiling water with its contents into it. Be very careful as the liquid will splutter and can cause burns. Mix well and close the lid. Simmer on low heat till for about 5 mins till all the water has been absorbed. Pour another tbsp of ghee on top. You can also add in raisins or chopped almonds or cashwenuts if you wish. You will need to add them at the time of adding water to the roasted idli rava. Add in the salt and spices and mix well. Slowly add water one tbsp at a time. 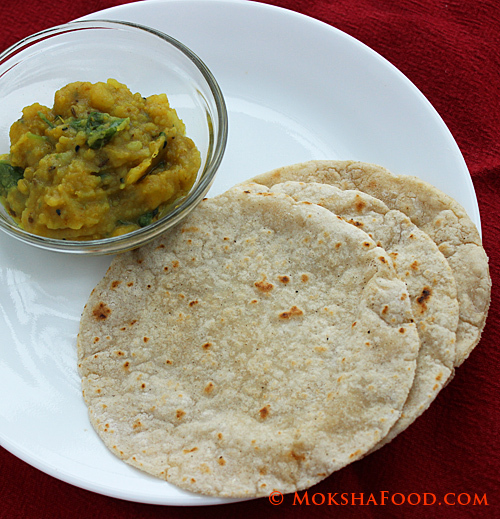 Chickpea flour is very sticky flour to work with so adding less water helps. When you feel the flour is coming together, add a tsp of oil at a time to help the dough to come off your hands and roll into a ball together. Once the dough is ready, pinch off small lemon sized balls. Heat a saucepan with enough oil to deep fry the puris. Roll each ball into small disc. I didnt use any flour so the dough kept sticking to my rolling pin and parchment paper. Add a drop of oil if it helps to roll it. This dough should be rolled without any excess flour. Drop a tiny ball of dough just to test the heat of the oil. If it floats up then then oil is ready. Drop the rolled disc gently and tap it till it puffs up. Turn over and let the other side puff up too. Remove onto an abosrbent paper. Repeat the process to fry more puris. 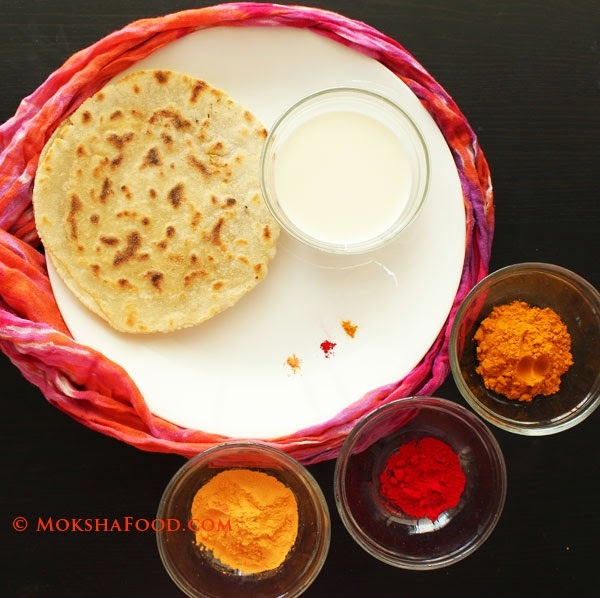 I served the hot besan puris with kala channa and halwa for my little Kanya/daughter and she was so pleased with it. I guess that too is a blessing in a way. 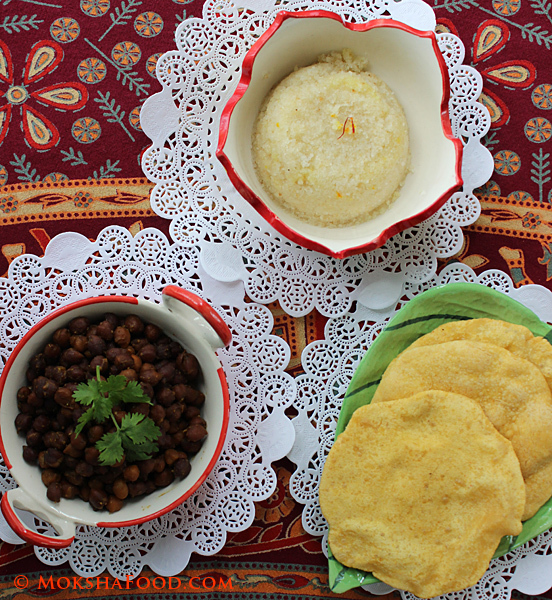 Note: The besan puri and kala channa are both made up of chickpeas so it doubles the protein factor but also makes it a tad difficult to digest. You can swap the besan puris with the Amaranth ones for a change of flavor. UPDATE: I later also made amaranth puris and we unanimously decided that it pairs better with chana and halwa than besan puri. But i leave it up to you to try and let me know.